There are few football clubs and football club logos better known throughout the world than Manchester United Football Club, so it was fantastic to be asked by MUFC to do some pumpkin carving for them in October. Our professional pumpkin carver Rich Spence used a stencil to carve their intricate iconic logo onto their Halloween pumpkin. Their well known mascot the red devil kept up the spooky theme. 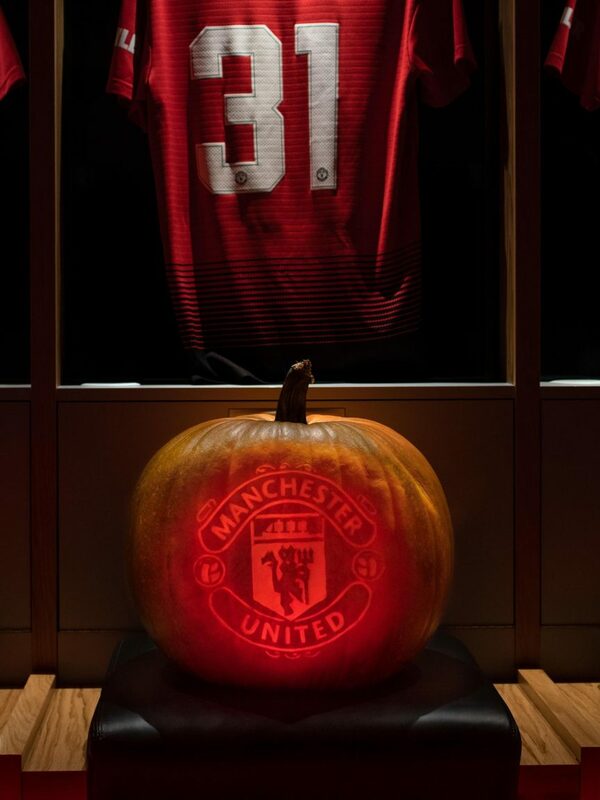 The pumpkin then made it’s way to the illustrious grounds of Old Trafford for a tour and popped into the famous changing rooms where players such as George Best, Eric Cantona, David Beckham, Wayne Rooney and more recently Nemanja Matić, whose number the pumpkin had it’s photo taken in front of, have got ready for games. It’s somewhere that United’s legions of fans would love to get a good look at. Lucky pumpkin! We have carved and delivered pumpkins from our studio in Yorkshire to many Premiership football clubs in the past, including Chelsea FC, Manchester City FC and the Premier League themselves. Maybe some of the Yorkshire clubs would like one next year?